Photographer Mark Olexik, WRAL, Capitol Broadcasting Co. Yard signs for recruiting hard-to-find school bus drivers are springing up in North Carolina. Bright pink yard signs for recruiting difficult-to-hire school bus drivers have been installed in one North Carolina school district, reports Emmy Victor at WRAL in North Carolina. 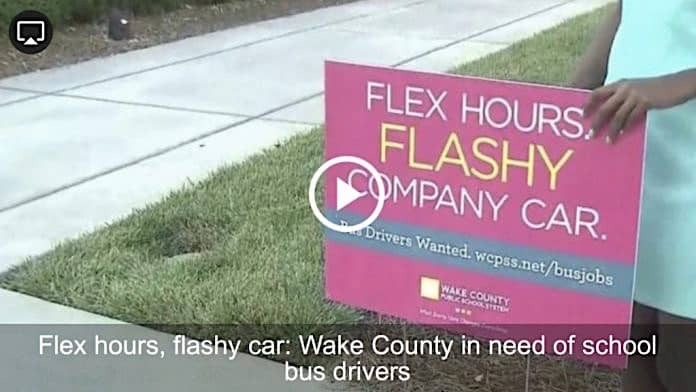 A Wake County, N.C. school district is going down the road of advertising the benefits of landing a new job driving a flashy vehicle with brightly colored paint AND having flex hours, in order to fill its driver vacancies. After continued challenges trying to fill constant bus driver vacancies, school officials decided earlier this year to increase starting wages and benefits for the drivers—but the shortage is continuing. So it looks like the Pepto-Bismol-colored yard signs will be staying in place for much or all of 2018, despite several career fairs being held, and another one scheduled for July 14. It is expected that some school bus drivers will have to drive two routes, until the continued shortage is solved, WRAL noted. Even getting to drive a company car with the mileage paid for, doesn’t seem to be enough of a persuasion any more. But if you have been unemployed for a long time, and you would like to be a school bus driver, show up with your resume at Carroll Magnet Middle School in Raleigh on Saturday morning, and the chances are very very good that you will be hired. Reporter Emmy Victor and photographer Mark Olexik at WRAL, Capitol Broadcasting Co., found some new pink yard signs sprouting in green lawns.